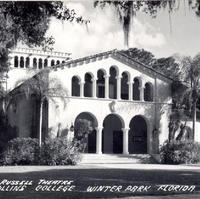 Postcard showing the Annie Russell Theatre, located on the campus of Rollins College at 1000 Holt Avenue in Winter Park, Florida. The theatre was built in 1932 and was donated to the Rollins by Mary Curtis Bok Zimbalist in honor of her friend, Annie Ellen Russell (1864-1936), a British-born, American theatrical actress. Russell officially retired from the stage in 1918 and moved to Winter Park.She was encouraged by a friend to teach at Rollins College, and in 1931, the Annie Russell Theatre was founded. She opened the theatre in 1932 with a performance of In a Balcony. She taught at Rollins College until her death in 1936. The Annie Russell Theatre seats 377 people. Original 5.5 x 3.5 inch black and white postcard: L. L. Cook Company, Milwaukee, Wisconsin: Private Collection of Thomas Cook. Digital reproduction of original 5.5 x 3.5 inch black and white postcard: L. L. Cook Company, Milwaukee, Wisconsin. Originally published by the L. L. Cook Company. Copyright to this resource is held by L. L. Cook Company and is provided here by RICHES of Central Florida for educational purposes only. "Our History." Rollins College. http://www.rollins.edu/annierussell/history/index.html. Jensen, Joan M. 2012. "The Politics of Performance: Rollins College and the Annie Russell Theatre." Florida Historical Quarterly. Vol. 91, No. 1 (Summer 2012): 49-85. "The Politics of Performance: Rollins College and the Annie Russell Theatre"
“Annie Russell Theatre Postcard.” RICHES of Central Florida accessed April 25, 2019, https://richesmi.cah.ucf.edu/omeka/items/show/971.